The final Midland League XC fixture was held south of Gloucester, despite the questionable Midlands location, the course was definitely worth the trip down the M5. The first challenge was navigating the farm animals and mud (which had been significantly lacking this cross-country season) to reach the start. Despite the strong winds, the BRAT flag and tent were up and we headed out to walk the course. What appeared at first as a large lake, was in fact a very flooded field. If you looked closely you could see the course markers poking out of the water where they had been placed the day before. A slight course change to avoid swimming made for a challenging course with an extra couple of hills, and little did we know a bonus km and a half. We took it all in our stride. All warmed up, red ribbons in and ready to go, we lined up on the start ready to give it our all. Gun sounded and off we went. Two small laps saw us caked in mud from the off, a couple if gradual climbs meant the field was soon spread out and as we battled the wind it was time to dig deep for the long run. There was great support from the side-lines from Richard and Rob who were kindly volunteering on behalf of the club. Into the final field, it was a push up-hill to the welcomed finishing funnel. Molly Browne finishing in 5th place, Anne Kenchington closely followed in a fantastic 8th, Jen Straw showed a fabulous return to the mud in 32nd (4th Masters), Eloise Lee was came flying up the hill to a 45th finish, Helen Pike took advantage of the extra distance and came a superb 48th (8th Masters), Rachel Farquhar secured the senior team finish with a brilliant run for 53rd, Sarah Hinksman ran amazingly despite a long lay-off with injury to finish 86th and ensure BRAT had a Masters team (48th Masters), Megan Thomas had a great run to finish 104th closely followed by Sophie Dalley with a fantastic run to finish 111th and with a big smile on her face! Despite a season’s worth of mud in one race and the added distance, the BRAT ladies showed they were more than a match for a challenging course. It was agreed that it had been tough, but a real cross-country course and a lot of fun! Not too sure we enjoyed the car journey home covered in mud and smelling slightly of cows quite as much. The team rallied on the day to push their overall team placing from 5th to 4th, behind Birmingham and Loughborough University teams and Birchfield – which is an incredible achievement. Molly also managed to claim the silver medal overall for the league. A big thank you to everyone who has run across the season – we couldn’t have done it without you, and it wouldn’t have been nearly as much fun! 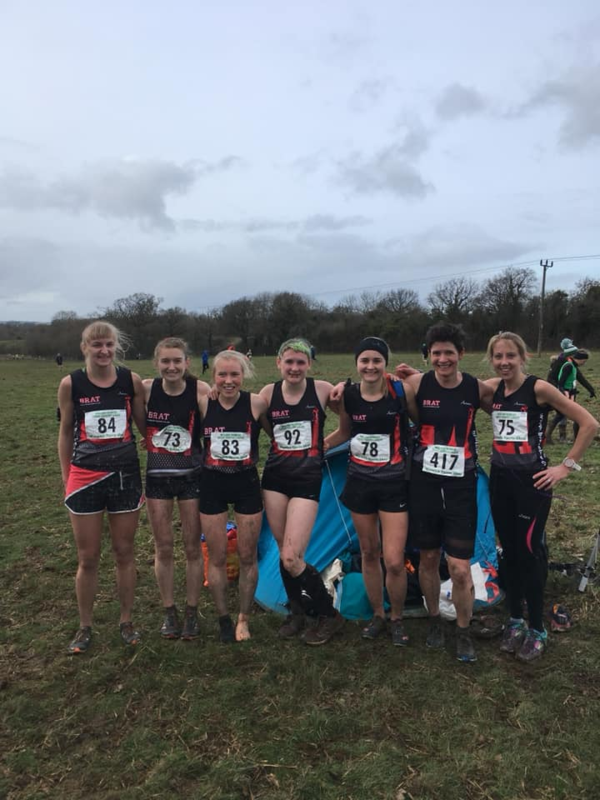 One more club race to go – a few hardy runners are heading up to Leeds next weekend for the National! Molly Browne, Anne Kenchington, Jen Straw, Eloise Lee, Helen Pike, Rachel Farquhar, Sarah Hinksman, Megan Thomas, Sophie Dalley, Annie Byrne, Sheridan McWilliam, Rosie Davies, Cathlyn Bone, Rachel Brown, Lisa Ferguson, Hannah Ludford, Beccy Tipping, Mel James, Hazel Murray, Claire Keene, Anne Virden, Catherine McNicholl, Catherine Robertson, Rosie Forster, Liz Painter. Previous: Previous post: BRAT’s Stagger to Victory!